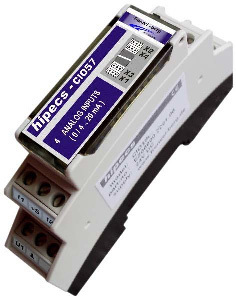 The Hipecs-CIO57 from Frenzel + Berg is a CANopen module with four current inputs for 0-mA-to-20-mA or 4-mA-to-20-mA signals. It is designed for extensions of PLC controller systems or similar applications. The I/O ports are galvanic isolated from the CAN lines. The resolution of A/D converter is 16 bit. All input channels are protected against short circuits and over current conditions. The CANopen interface complies with the CiA 301 application layer and the CiA 401 profile specification. All specified bit rates up to 1 Mbit/s are supported. The operating temperature is from 0 °C to +55 °C, a supply for external sensors is provided, the product measures 17,8 mm x 90 mm x 62 mm, and it comes in a plastic housing for mounting onto DIN carrier rails. The module provides four TPDOs and four RPDOs. It features variable PDO mapping, and PDO linking. The following CANopen PDO scheduling modes are available: synchronous, asynchronous, event triggered, cyclic, acyclic, and remotely requested. However, CiA does not recommend to use remotely requested PDOs. Event timer and inhibit timer for all transmit PDOs is provided. Heartbeat functionality is provided as well as the for new designs not more recommended node/life-guarding function.